Born in the village of Mayo in the Yukon region of Canada, Natalee Kline was raised in Mayo, Juneau, and the Hawaiian island of Kauai, before moving to Anchorage in 1989. At the age of six, Natalee began to emulate the traditional healing methods of her aunt, Florence Dyck. Her Tlingit heritage is from southeast Alaska in the town of Dyea near Skagway. “As the eldest cousin in my family, learning and sharing the family traditions of physical healing was a natural expectation,” Kline stated. 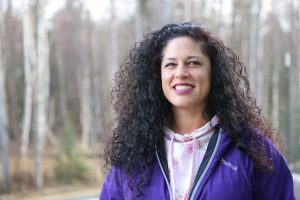 Natalee received her aerobics, aquatics, and personal training certificates in 1998 before graduating from the clinical massage therapy program in 2000 from the University of Alaska Anchorage. Natalee joined SCF as an intern in 2001 in what is now SCF Complementary Medicine. She worked as an intern until she was hired full time as a clinical massage therapist that winter. Her passion for learning helped her to complete her bachelor’s degree in health services administration at Alaska Pacific University. Natalee was then promoted to manager of SCF Physical Therapy and Exercise. Upon hearing about the Tribal Doctor Training Program in the spring of 2017, Natalee traveled to her Ta’an Kwach’an Council of the Yukon First Nations to seek approval to carry forth her family’s traditional healing roots and learn from Tribal Doctor Sarah Smith. “After 15 years of applying as a Tribal Doctor Apprentice, I was thrilled to hear about the Tribal Doctor Training Program!” said Natalee. Natalee was accepted into the program this past summer and has since transitioned into a full time role as a Tribal Doctor in the Traditional Healing Clinic. She looks forward to embracing her family’s traditions of providing traditional healing to the Alaska Native Community.